Choose from the wide range of Dining Tables by Exclusive Furniture World. 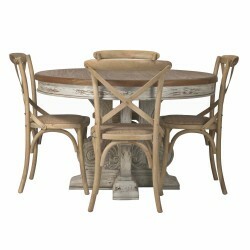 150cm Rustic Round Dining Table Dimensions: H78 x W150 x D150 cmMaterial: Hardwood (white cedar)EAN:.. Distressed Painted Base 120cm Dining Table Dimensions:H77 x W120 x D120 cmMaterial:Mahogany WoodEAN:.. Distressed Painted Recycled Elm Dining TableDimensions:H78 x W210 x D90 cmMaterial:Recycled ElmEAN:6.. The Doral table is crafted in traditional French oak style. The rounded top edges gives a delicate s.. The Doral extension table is crafted in traditional French oak style. The rounded top edges gives a ..
French Chateau White Dining Table with Washed Wood Top Dimensions:H76 x W160 x D96 cmMaterial:Mahoga.. Heavy Distressed 145cm Round Dining Table Dimensions:H77x W145 x D145 cmMaterial:White CedarEAN:7434..
Louis XV French mahogany table. The table shows extremely high levels of detailing, especially on si.. The Orland 1.5 Metre fixed table is finished in solid oak with oak veneers. Whilst this table matche..